David Morgante It probably identifies the people who protect him. When there are so many people who would like to do him harm its probably a good idea to have it so his people are easily recognizable. Oscar Ferret they are wrong it means trump has joined forces with planet zog and wants to turn the world in to a marshmellow. Dave Emerson It identifies Trump private security staff, as well as campaign “inner circle” staff who are allowed to get close to Trump. The Secret Service uses the same method with a red pin. It’s an easy visual identifier to allow his security to pick out people who don’t belong quickly. 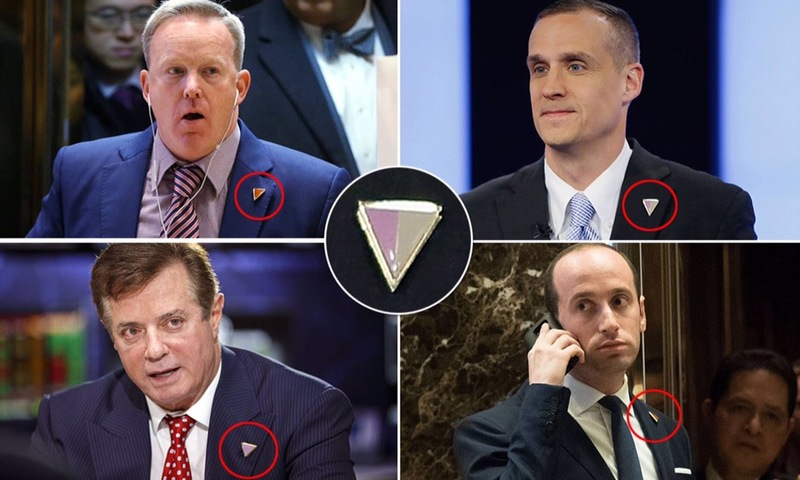 Simply look at their left lapel, if they don’t have the pin there, they aren’t allowed close. Amy Boring I volunteered at the Bernie Sanders rally in San Diego. They had them on too. It’s simply Campaign staffers. Much like a lanyard it made it easy to identify people that could move freely from place to place on the rally floor. As much as I disagree with Trump this video is propaganda.